Top Rated Local® is pleased to announce that Ann Steinfeld Physical Therapy is a 2018 award winner, thanks to their enviable 96.00 Rating Score™ and an average review of five stars! "I've been going to Ann Steinfeld's offices for my PT after my ACL was replaced and all I can say [are] good things about the office. All the physical therapists are kind and really knowledgeable. The people they hire for assisting the therapist are great as well and [the person] at the front desk is awesome with helping you with your insurance problems. I had such a great experience with the office staff that I wish I could stay longer in California to continue going to see them. Thank you so much [to the team]. You all made my healing process so much better." - Nick B.
Ann Steinfeld, a licensed physical therapist and owner of Ann Steinfeld Physical Therapy, took some time to speak with us about her business' overall success, both online and off. "In the first visit, we give them hope," she said, when asked what really makes her offices and team different than other physical therapists in the area. She believes that her background and ability to provide unparalleled care is what makes clients want to write reviews. Ann and her team provide top quality care to their patients, analyzing symptoms and developing personalized care plans. Ann's advice to other businesses (especially physical therapists) in regard to building a stellar online reputation? "[You] need to invest some money. You have to devote five- to eight-percent of revenue to marketing. When [we] did that, [we] saw positive changes. Work on your business, not in your business. Hire people to do the services, while you focus on growth. If you are a physical therapist, be a member of the private practice." Thank you for taking the time to speak with us, Ann! 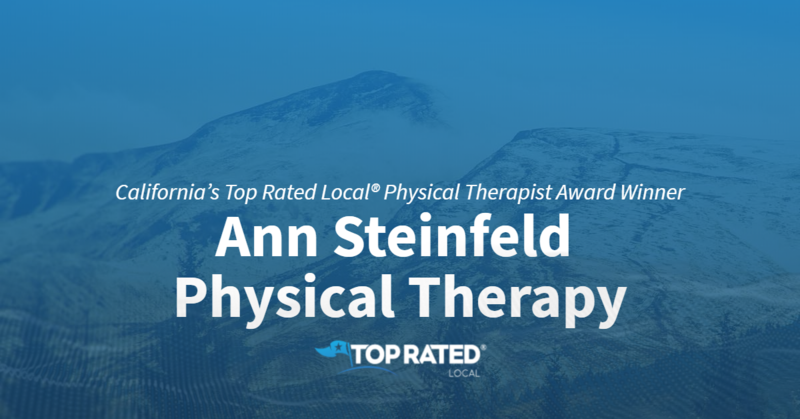 Congratulations to the team at Ann Steinfeld Physical Therapy for being a 2018 Top Rated Local award winner! For excellent physical therapy services in the Costa Mesa area, we strongly recommend Ann Steinfeld Physical Therapy. For media-related questions, contact Edan Devora, info@annsteinfeldpt.com or call (714) 556-1600. For more information regarding Ann Steinfeld Physical Therapy, visit: https://www.annsteinfeldpt.com. Ann Steinfeld Physical Therapy is a privately owned outpatient practice in Orange County, Calif. specializing in the evaluation and treatment of physical injuries and disabilities resulting from a wide range of conditions related to sports and athletics, surgical procedures, occupation, repetitive motion and accidents, as well as those specific to age and gender. Ann Steinfeld's highly skilled and trained, licensed physical therapists utilize a broad spectrum of the most advanced physical intervention and rehabilitation techniques to alleviate pain, restore mobility, improve balance and coordination, and increase muscular strength and endurance. Referred to by leading physicians throughout Los Angeles and Orange County, Ann Steinfeld Physical Therapy provides a comprehensive team approach to ensure successful patient outcomes, while maintaining the highest quality of exceptional one-to-one care in an energetic, positive and ethical environment. For more information visit: www.annsteinfeldpt.com.